Upper respiratory infections are very common in cats, especially kittens. These infections usually respond well to treatment, though some cats can become quite ill, with severe cases occasionally becoming pneumonia. Medically, this group of infections is called feline respiratory disease complex. The term upper respiratory infection actually describes a complex variety of diseases that can occur alone or in combination. Generally, all of these diseases produce a similar set of symptoms that mainly affect the upper respiratory tract (i.e. mainly the nose and throat). The majority of cases are due to viral infections with herpesvirus and/or calicivirus. Kittens are the most at risk, especially before they have had all their vaccinations. Upper respiratory infections most common in cats who regularly have contact with other cats where cats are housed together in places such as shelters. Unvaccinated cats, cats that are under stress, and cats that are immunosuppressed because of conditions such as feline leukemia virus (FeLV) or feline immunodeficiency virus (FIV) are also at greater risk. Flat-faced cats, such as Persians, seem particularly susceptible to upper respiratory infections. 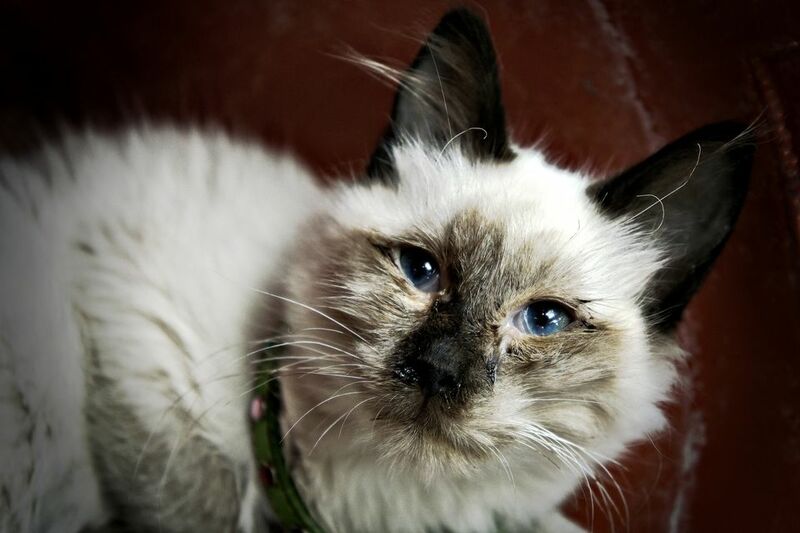 Upper respiratory infections are spread via the discharge from the nose and eyes, either by direct contact with infected cats or by contact with objects like dishes or bedding that have been contaminated with secretions from infected cats. A diagnosis of upper respiratory infection can often be made on the basis of history and symptoms. Further diagnostic tests can be done on the secretions to identify the organisms causing disease. For most cats, treatment is aimed at managing the symptoms. Though most cases are caused by viruses, antibiotics may be prescribed to fight bacterial infections that often occur secondary to viral infections. An eye ointment may be prescribed as well, and medications to help control the nasal congestion and discharge may also be prescribed. Most respiratory infections can be treated at home, but in cases where cats won't eat or drink or have serious breathing difficulties, hospitalization may be required. Intravenous fluids may be given to prevent dehydration and oxygen therapy can be used if necessary. Most cases clear up within a week to 10 days, although sometimes upper respiratory infections will hang on for a few weeks. For cases that do not respond to the usual supportive treatment, antiviral medications can be tried. Cats that suffer prolonged or repeated bouts of respiratory infections should be checked for FeLV and FIV. Once the symptoms have resolved, cats infected with herpesvirus continue to carry the virus forever, and cats infected with calicivirus carry (and can spread) the virus for an extended period (sometimes for life). With herpesvirus, the infection is usually only "active" after times of stress; at these times cats will be contagious to other cats and may have a relapse (show symptoms again). Vaccines against both herpesvirus and calicivirus are part of the routine vaccination protocol that will be recommended by veterinarians. They can be given either by injection or directly into the nose, and your vet can discuss which vaccine to use and an appropriate vaccination schedule for your cat. A vaccine is also available for Chlamydophilia, though it is typically not part of the routine set of vaccinations; your vet can help you decide if this vaccine is right for your cat. In young kittens, the vaccines are not fully protective until the full series of vaccines is given. Minimizing stress, as well as preventing contact with infected cats, can also reduce the incidence of upper respiratory infections. Cats should be kept quiet and comfortable during the course of an upper respiratory infection. Carefully wipe away discharge from the eyes and nose, and administer all medications as prescribed by your vet. A humidifier can help with managing the congestion. Because cats might lose their sense of smell or have painful sores in their mouths, their appetites may suffer. You can try feeding their favorite, extra-tasty canned food, or even a special veterinary diet that provides extra nutritional support if your cat's appetite is diminished. However, if your cat won't eat or drink at all, consult your vet. In multi-cat households, speak to your vet about any precautions you should take to minimize the risk to other susceptible cats in the home, such as isolating sick cats, or disinfecting food bowls and bedding.